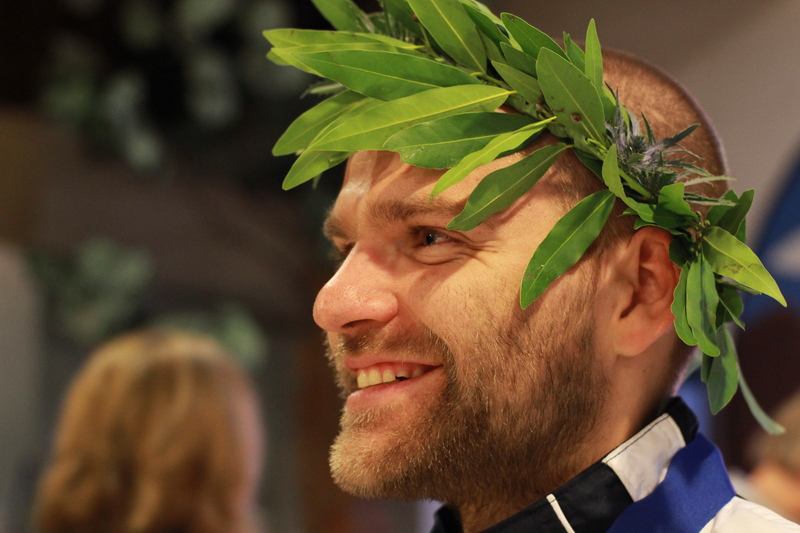 Have you ever imagined the Greek athletes, crowned victorious with laurel wreaths at the ancient Olympic games? 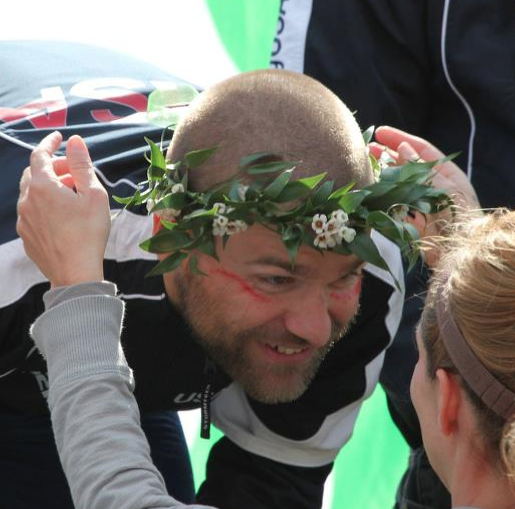 Or wondered why the sprig of laurel has come to symbolize victory, and is imprinted on modern Olympic medals? There is a story behind the laurel wreath – and of course it’s somewhat torrid and involves various Greek deities. 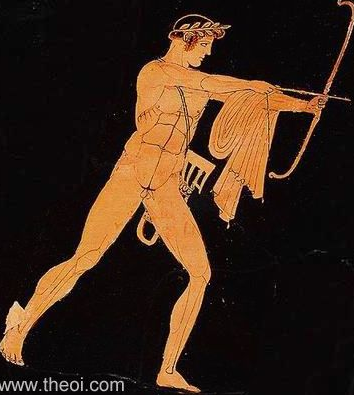 In order to prove his arrows were as powerful as those of Apollos, Eros shot Apollo in the heart with a gold tipped arrow, forcing him to fall in love with a nymph named Daphne, who was also shot by Eros – using a lead-tipped arrow. The leaden arrow turned her against Apollo, and all men in fact, making her prefer hanging out in forests alone. Apollo pursued Daphne unrequited, his love all-consuming. Even in her flight from him she was alluring. Eventually he gained on her and her strength failed, at which point she begged her father to save her, which he did by turning her into a laurel tree. 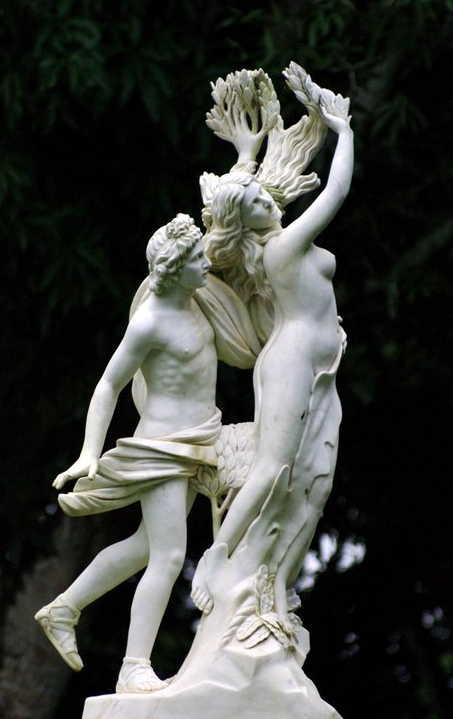 sculpture by Gian Lorenzo Bernini – Apollo e Dafne: Apollo chases Daphne and she turns into a laurel tree. “Since you cannot be my wife,” said he, “you shall assuredly be my tree. I will wear you for my crown; I will decorate with you my harp and my quiver; and when the great Roman conquerors lead up the triumphal pomp to the Capitol, you shall be woven into wreaths for their brows. And, as eternal youth is mine, you also shall be always green, and your leaf know no decay.” The nymph, now changed into a Laurel tree, bowed its head in grateful acknowledgment. 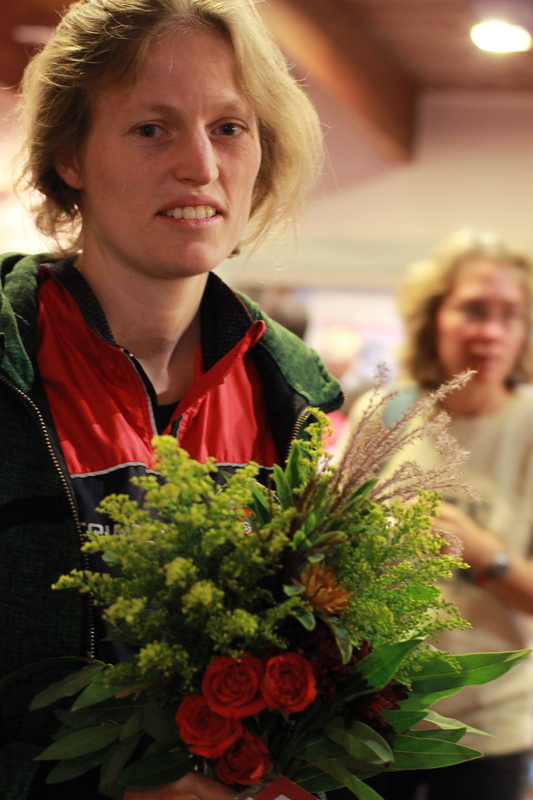 The laurel was part of my inspiration as I created the victors head wreaths and other floral awards at the illustrious North American Orienteering Championships this past October. Laurus nobilis, also known as Sweet Bay or Bay Laurel, is not only used for victory crowns, it’s an herb commonly dried and used in soups – bay leaf. 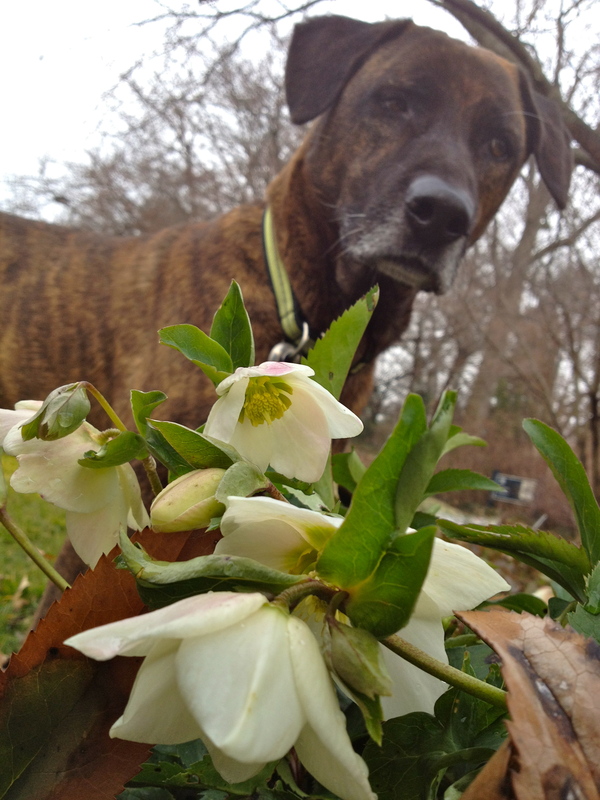 When fresh, if you crush or rub the leaves, a sweet scent is released. That is the sweet smell of victory, of course. 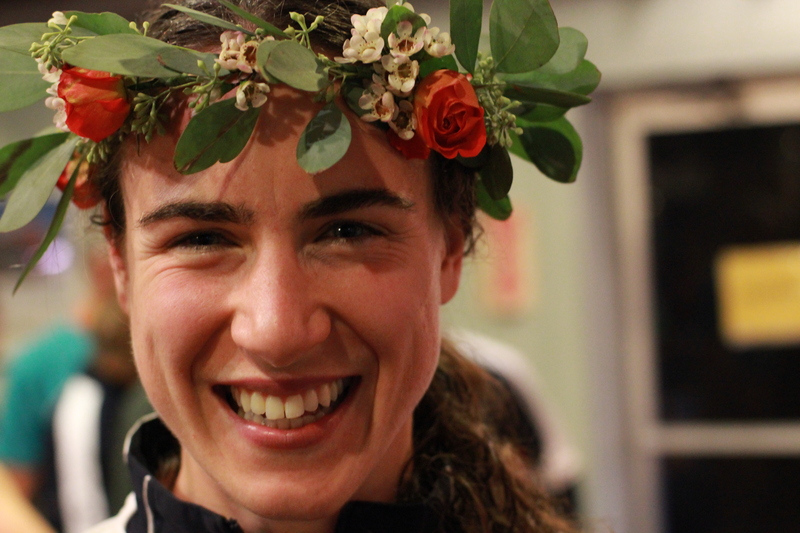 Here is superstar Ali Crocker again, wearing a wreath bedecked with seeded eucalyptus, spray roses, and waxflower. She was the first place North American F-21 winner of the Middle Distance at NAOC. Sandy Fillebrown of DVOA, the astoundingly amazing event director at NAOC, offered me this floral opportunity – which I’m proud to say was roots to blooms very first ‘outside of the family’ commission. 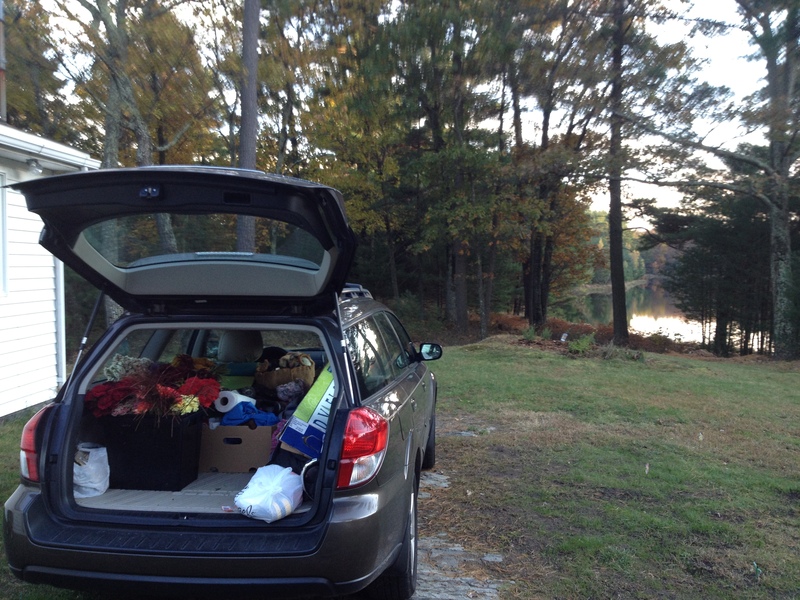 My car filled with flowers at the lakehouse we rented. It was a pleasure to do floral design surrounded by such incredible beauty. Because the sport of orienteering is a family tradition, and something I’ve just started doing in earnest this year, I was doubly excited for this floral challenge! My worlds were colliding. In fact, not only was I creating these awards, I was competing at this event – run in the morning, award ceremonies in the afternoon, make more floral awards at night! 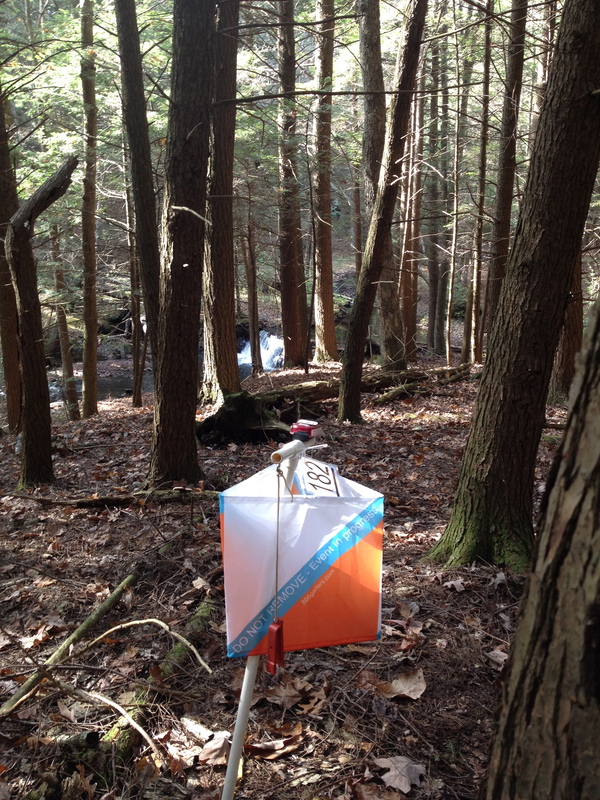 Orienteering is a sport that requires speed and smarts – using a map and compass, you must navigate through unknown terrain to find the points on the map that correspond with orange and white flags in the woods. It’s a timed event, and you compete against others in your age category. 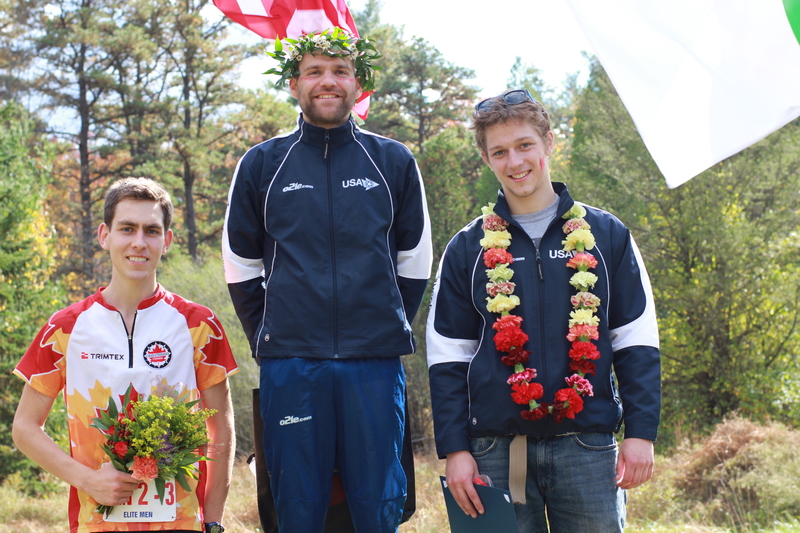 NAOC is basically the top event in North America, so these floral awards were going to the top 3 athletes in the male and female age 21 category for 3 days of races. (That’s 18 awards for me to create.) First place awards were floral head wreaths. 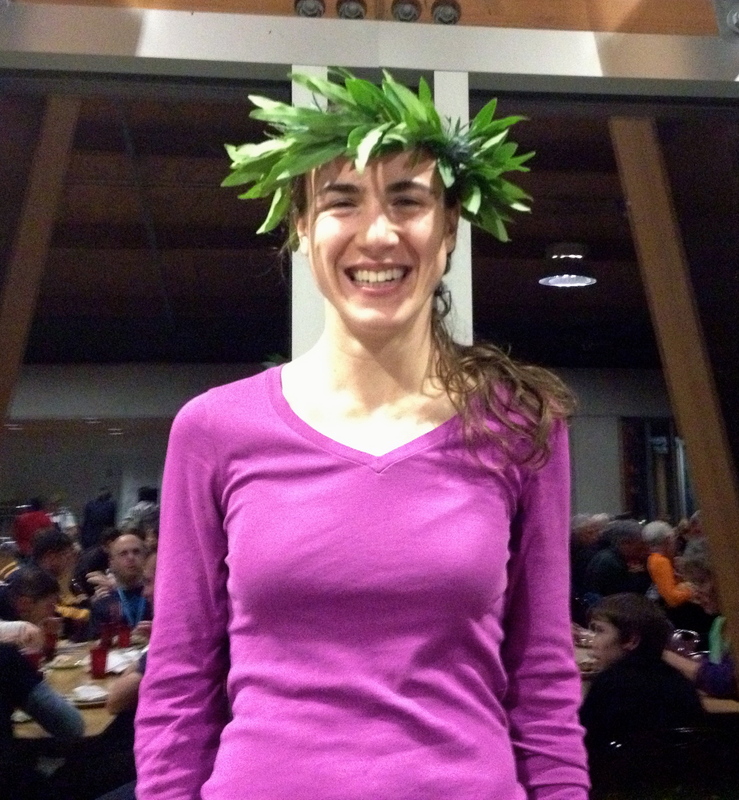 For second place awards, I created neck garlands like leis, and third place got a handheld bouquet. 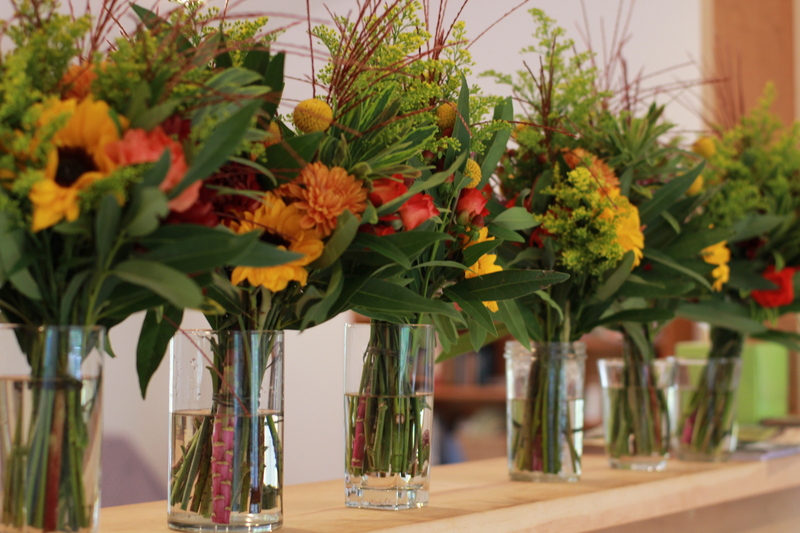 I made the bouquets first, since these could be in water right up until they were given out. I used bay laurel, spray roses, eryngium, miscanthus from my parent’s house, euphorbia from my garden, italian ruscus, goldenrod, sunflower, hypericum berry, ‘garnet king’ mums, ‘bronze cushion’ pom pons, ‘purple bride’ kale, and craspedia. Louise Oram (GVOC) holds her 3rd place award for the Long Distance at NAOC. 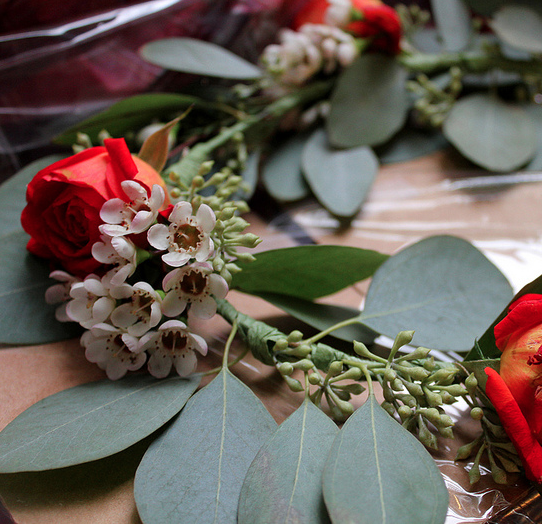 Each night, I made the neck garlands for the next day’s awards. 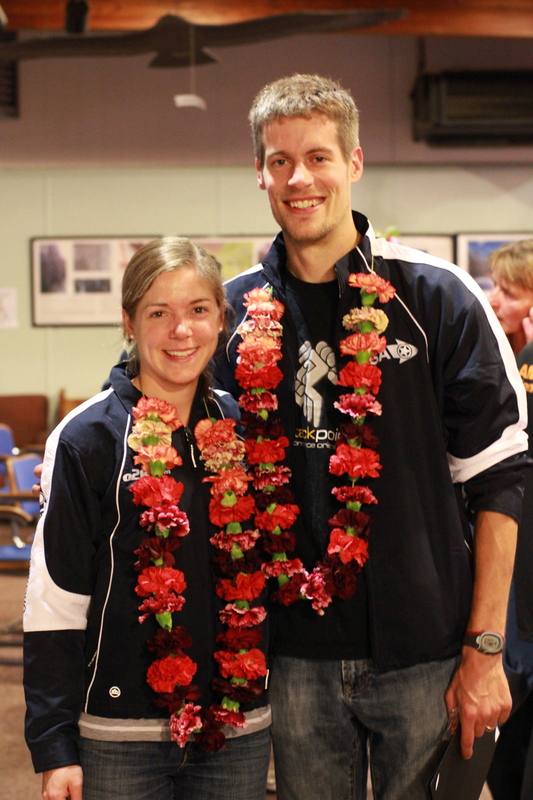 The neck garlands were really a blast to make. 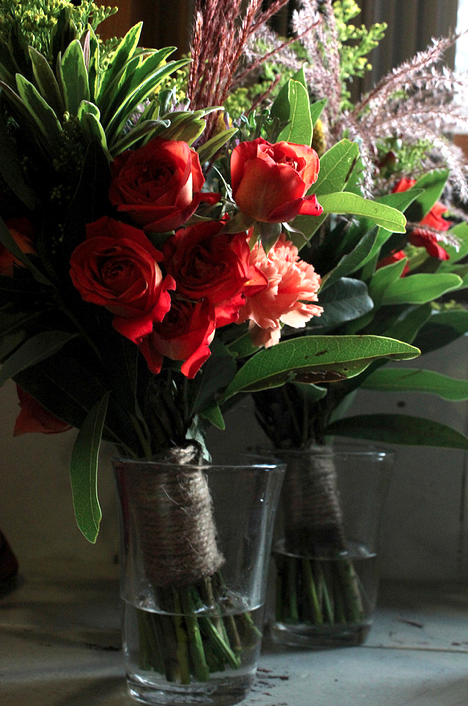 Essentially you are just stringing carnations together – and I wouldn’t use any other flower because the carnation is the toughest and has a big huge calyx – the green base of the flower that connects with the stem. Serghei Logvin (GHO) North American M-21 2nd place winner of the Long Distance at NAOC. 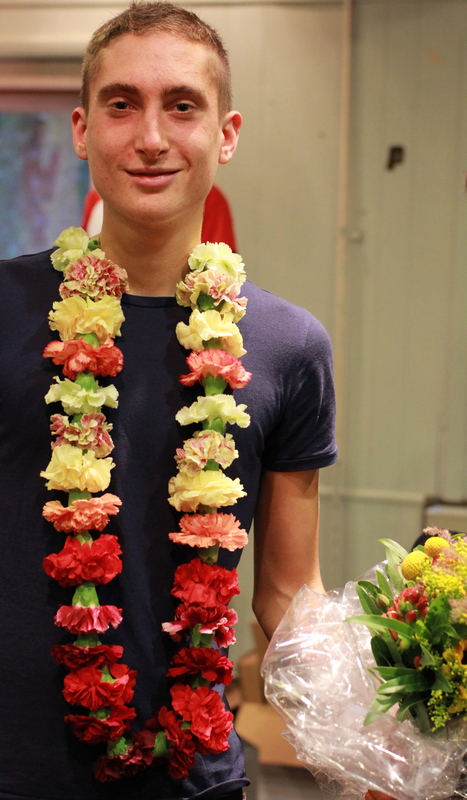 He is rocking his neck garland by roots to blooms! 1- Measure out a length of string or yarn (I used yarn because that’s what I had and it’s comfy on the neck.) The length is to your liking. 2- Cut carnations right down to the calyx. I used 26 carnations per garland. 3- Set out a design you like on the table in the intended shape. 4- Thread an embroidery needle with your length of yarn. Pierce the first carnation from the bud to the calyx end, moving the carnation down your piece of yarn. I continued through all 26 carnations this way – from bud to calyx – but if you wanted the flowers to be facing upward on both sides of the chain when worn, you would split your flowers in half, and pierce the second half from calyx to head. This is a bit more difficult to physically do. I tried it both ways and ended up liking the look of the flowers all going in the same direction, which means that when you wear it, one side starts with the calyx side up, and one side starts with blooms side up. Samantha Saeger (NEOC) and Ken Walker Jr (CSU,) second place North American F and M 21 winners of the Middle Distance at NAOC. 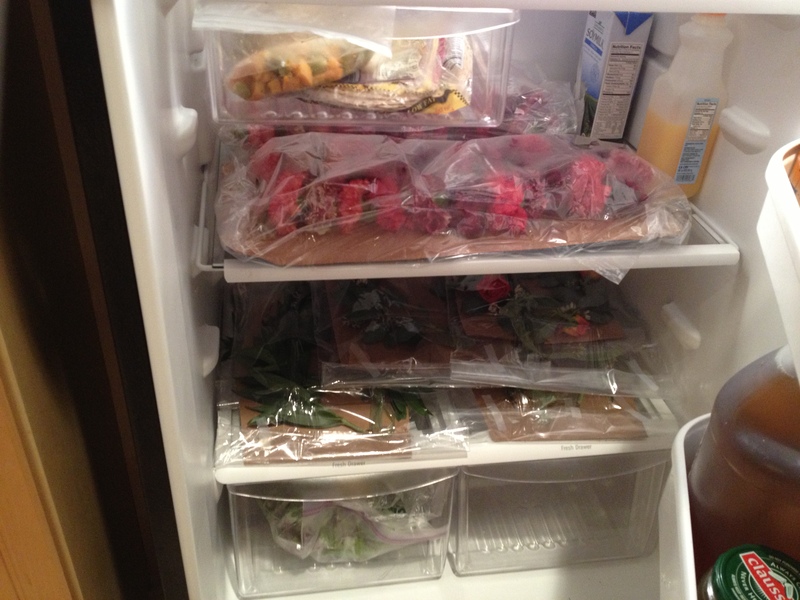 When the neck garlands were complete, I put slipped them into cellophane bags and stored them in the fridge overnight. Once out of the fridge, I think they lasted for a few days. The same goes for the head wreaths. 2 – Take your base material (foliage like laurel, seeded eucalyptus, ruscus, etc) and lay it against the bind wire. Using floral tape, tape the stems of the foliage onto the wire. Continue taping the stem, around leaves. 3- Add more foliage as you go. The floral tape can be tricky to work with. It just takes practice to maneuver it around leaves. You can either add flowers now, or go back later and add them. I created the foliage base first, and then added the flowers in groupings by taping the stems onto the wire with floral tape. I used roses (spray roses, small buds) and waxflower. 4- Try it on. Look in the mirror. See what looks out of place and trim back or move materials around. Finally, thread a ribbon through the two loops you created and tie in a bow for ease of changing the length. Voila! You have created a head wreath, so fun to wear. It was really an honor to crown these amazing athletes with custom awards. 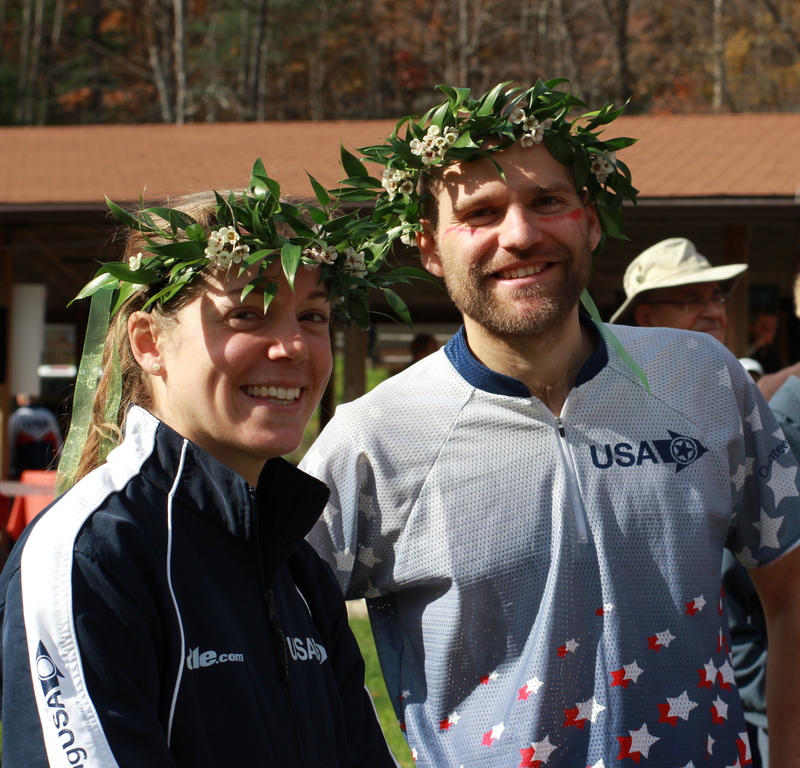 Photo by Ken Walker Jr.
Samantha Saeger (NEOC) and Ross Smith (CSU) crowned with my wreaths of Italian ruscus and waxflower. They were first place F-21 and M-21 North American winners of the Sprint at NAOC. Creating these custom sport awards was a great learning experience for me, and it was such an incredible honor to see my work worn by the top North American orienteers! 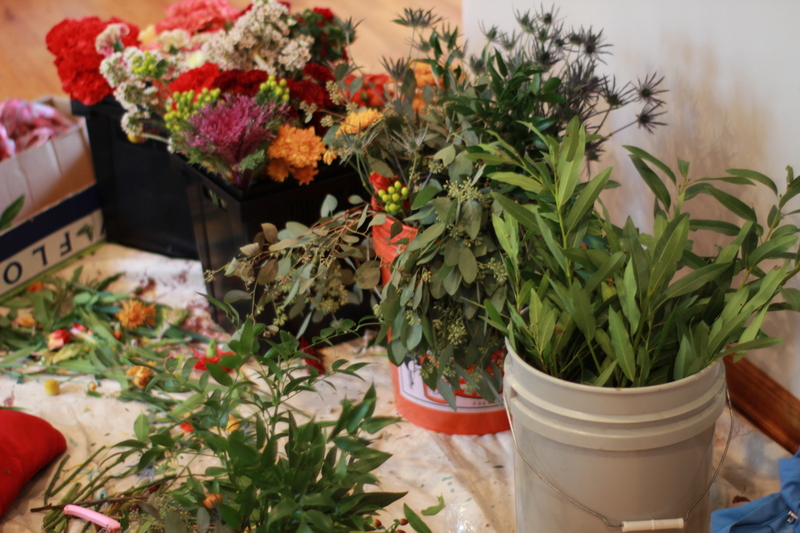 I would like to thank Sandy Fillebrown and DVOA for the opportunity, and Peicha Chang of falls flowers for assisting me with acquiring floral materials, and her instruction on making head wreaths for the wedding work we did previously was also very helpful. I really enjoyed this project and hope there is more sporting award work in my future!